The Adonit Jot Pro Stylus is touted as the most precise touch capacitive stylus on the market. I’m not a heavy user of a stylus on the iPad, but I like the idea of being able to take handwritten notes at certain times. The Jot Pro has a number of features that sounded attractive to me, so I’ve been giving it a try over the last few days. I’ve tried out a few styluses for the iPad in the last couple years – none of them are terrible, but none of them have convinced me that I could really take notes with them better or more quickly than by using the iPad’s on-screen keyboard. 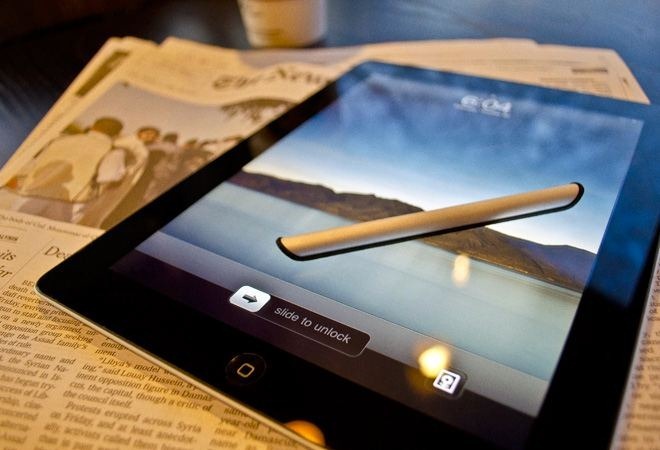 It was always a bit of nuisance to consider using a stylus when out and about with the iPad as well – since there was generally no easy way to have the stylus at hand. There are only a very rare few iPad cases that have any kind of storage for a stylus, and I’ve never much liked the idea of carrying one in a pocket. 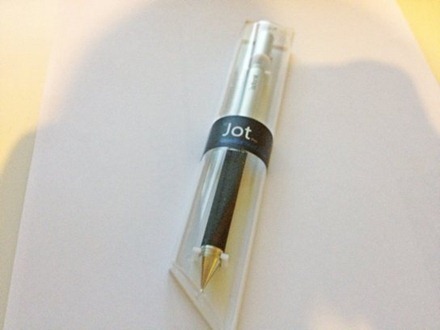 — It came nicely packaged and is a very handsome and relatively slim stylus. — The rubberized grip is a nice feature. — The use of a ‘precision disk’ and ballpoint-like tip feels a lot nicer and more natural to write with than the typical nub pointed stylus. — Its magnets work pretty well. It stays pretty firmly in place on the right side of the iPad 2, and very firmly on the iPad 2 Smart Cover. That’s about if tor lightning first impressions – I have a good feeling about this one. 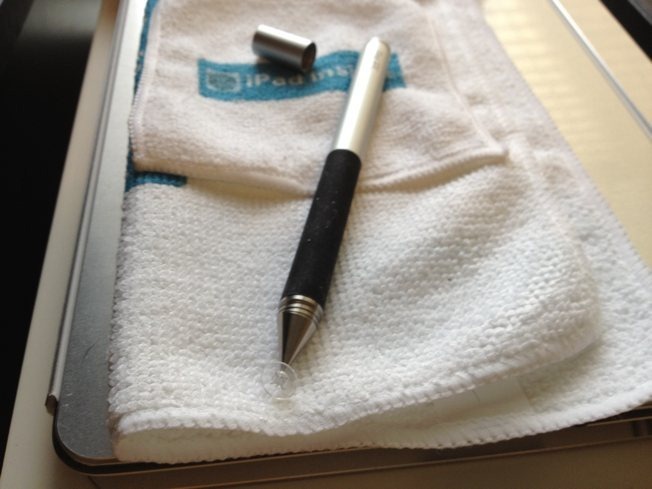 The Styló Stylus started life as a Kickstarter project a few months ago. 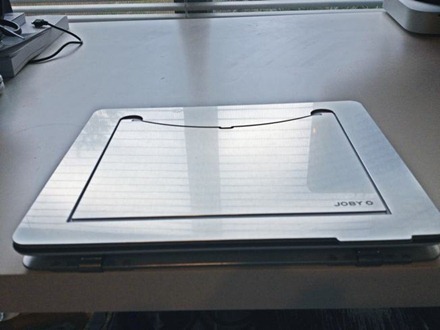 Its big unique selling point is that it attaches to the screen of the iPad 2 (or the iPad 2 Smart Cover) via rare earth magnets. I loved the concept of not needing to figure out where to carry a stylus when you want to use one with the iPad 2 and thought the Styló looked great too, so I happily backed the project. The project got funded, these styluses are now available to buy, and the manufacturers (Just Think Design) sent me a few samples recently. 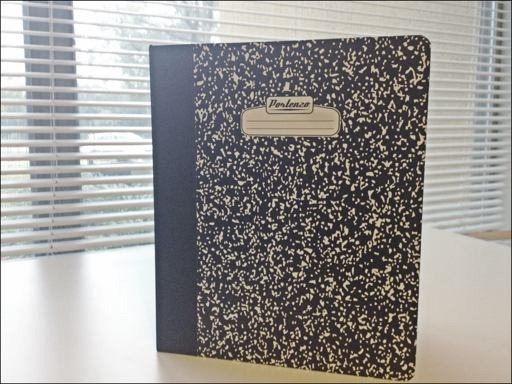 The Portenzo Composition for iPad 2 Case is a clever case that looks just like an old-school composition notebook. 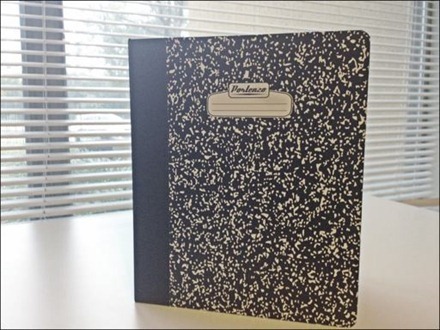 Actually, just like current composition books as well – I wasn’t sure these were still around but my daughter set me straight on that. 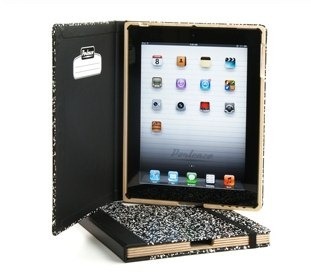 Here’s an iPad 2 case that I really like the look of – the Composition iPad 2 Case from Portenzo. I got an email from Portenzo yesterday about another of their products, but this is the one that immediately caught my eye. — It’s made with traditional bookbinding materials, and made here in the US. 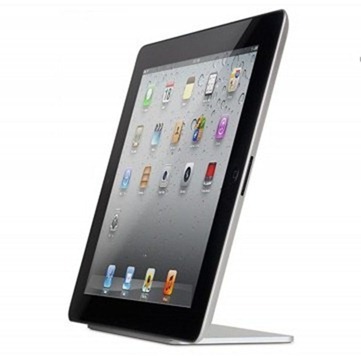 — It support the iPad 2 automatic sleep/wake feature. I ordered one yesterday and I’m looking forward to trying it out. You can get more information on the Composition case, or place an order (pricing starts at $79.95) on the Portenzo product page for it. HoverBar is a great looking new iPad 2 accessory from the ever so clever folks at Twelve South. It’s an adjustable arm that lets you ‘float’ your iPad 2 alongside your PC screen or to position it creatively in the kitchen or anywhere else that suits your needs. 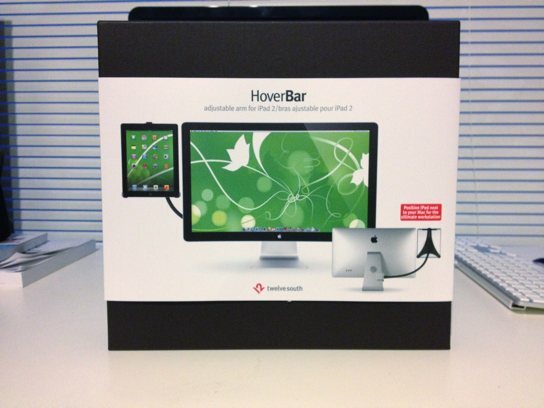 HoverBar floats iPad 2 next to any iMac or Apple display with an L-shaped stand. The sleek black, flexible arm on HoverBar connects to your Mac using a sturdy, silicone-lined clamp that leaves no trace. HoverBar has enough muscle and reach to position iPad above or beside any size Mac. Flex the bar and tilt iPad in any direction to find your favorite viewing position. What could be better than one iPad hovering above your Mac? Having a second floating beside it. When I first saw the video demo of the Gorillamobile Ori for iPad 2 case, I was impressed with how slick and versatile this case looked. I ordered one that same day and it arrived this morning. — It’s sleek and unique looking – all lightweight aluminum goodness. — It’s extremely versatile. You can quickly swivel the iPad between landscape and portrait orientation. 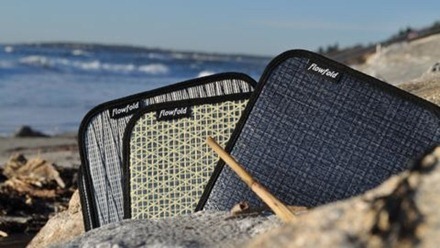 Flowfold iPad Sleeves are a superb case for the iPad 2 or original iPad. They started out as a Kickstarter project last year; the project got funded and these excellent cases are now available to order. I was fortunate enough to be given a sample unit to test while the Kickstarter project was going on, was thoroughly impressed, and became a project backer. I’ve been using the Flowfold sleeve for a couple months now and I can’t recommend it highly enough. It’s one of my favorite cases for my iPad 2. So I’m happy to say there are two bits of good news on Flowfold to share with you today: that they’re available to purchase now at the Flowfold site at a very reasonable $35 price point, and that we’ve got two to giveaway to a pair of lucky readers. iPad stands are among my favorite accessories for the iPad. My iPad 2 gets a ton of use every day alongside my MacBook Pro – so it needs a good home on my desk. A good stand to sit in when not fully in use. The Magnus iPad 2 Stand from Ten One Design is the latest one I’ve tried out. Ten One pitches the Magnus as boasting a sleek form factor, elegant Apple-like looks, and using the magic of magnets to hold the iPad 2 in place in the stand.